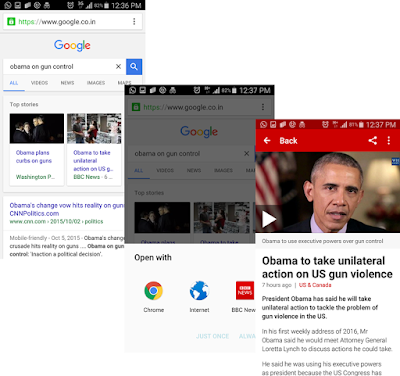 So put it simply, Google can index content in your mobile app, just like it does the webpages. You may wonder, if it is just applicable to engaging only those having your mobile app installed; but Google had confirmed they use app indexing as a ranking signal for all Android based searches, regardless of whether the app is installed or not. Before discussing further, let's understand a bit about deep links. A deep link is nothing but an hyperlink linking to a specific page within a website which is searchable or indexable by search engines. When it comes to deep links in a mobile app, it consists of using a uniform resource identifier (URI) that points to a specific location within the app instead of simply launching the app home screen. While in the case of web pages, URLs are standard HTTP/HTTPS; in mobile apps, URI varies depending on the which mobile OS the app is installed. For example, in android it is intents; in the case of iOS, it is openUrl. How to implement app indexing? Google gives a fairly decent documentation on how to enable app indexing at Google AppIndexing Guides. Basically it involves making your app support HTTP URLs (aka deep links using Intents, openUrls etc.). However to gain maximum benefit out of the search results, the app development also needs to use app indexing API in the case of Android apps or app indexing SDK in the case of iOS. This is fairly a complex technical requirement and would need the app developer's help. The good news is Google has a good documentation on implementing it as well as a testing it. Finally you would need to verify your website-appconnection. Is App indexing unique to Google? Increased focus on mobile is not just by Google; in fact Bing and Facebook also have similar efforts underway. Both of them uses an opensource framework called App Links (Visit App Links for more info). The interesting thing about app links is that it claims to be truly cross platform compatible. App Links are lot more simple; handling of deep links are through simple HTML metadata. A good documentation for app links is also available. With Google, Apple, Bing and Facebook having its own norms and guidelines to show app data in search engines, it's a nightmare for mobile developers and marketers!...what do you think…. ?